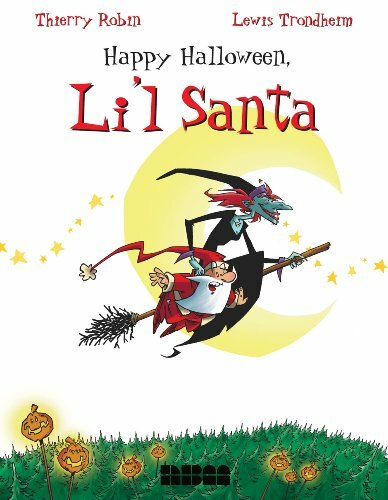 Happy Halloween, Li'l Santa is a graphic novel for children, in the same style as the author's earlier Li'l Santa. It was originally published in France in 2001, but no translation is necessary since it contains no words. The story is a simple adventure about Santa and his monster friends at the North Pole. There's an ecological theme when they encounter a massive machine that turns pine trees into matchsticks run by a group of huge thugs. At first, they try to be friendly with these men, but the giant in a checked shirt just destroys the gift that Santa gives him. So they have to do battle, and at first Santa's group does very badly, but of course, they prevail in the end. The artwork is lively and charming, and the novelty of wordless comics is fun. The characters are rich and the monsters are amusing. This is an unusual sort of children's book, and should appeal to readers with vivid imagination.